Dinner at Bill's Prime Seafood and Steaks. Fresh mahi for Bruce, perfectly fried Chincoteague Salts (salts being oysters) for me. Excellent. Mary Lou and Fred, we'll be in touch tomorrow when we figure out the rental car. 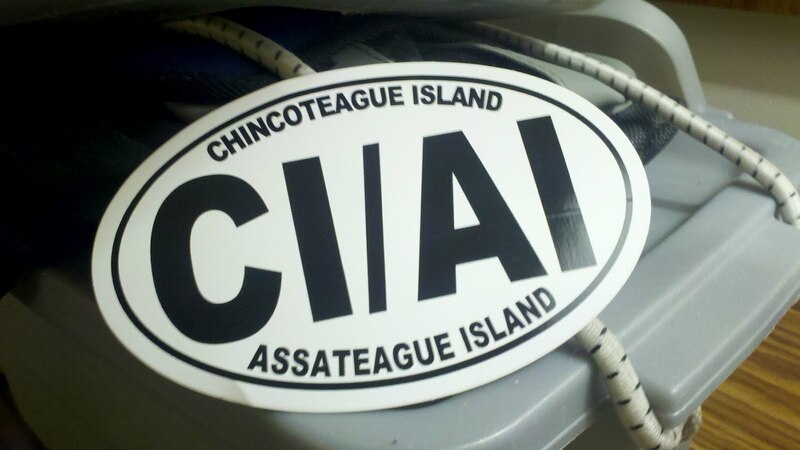 Arrived Chincoteague. Great trip. More later. Arrived Chincoteague this afternoon, a day or two earlier than expected. Tides, weather and bridge lifts worked out perfectly. More later. 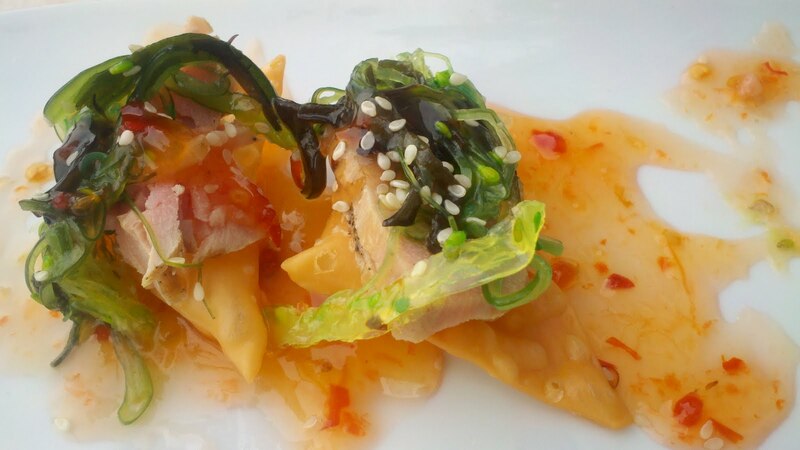 Tuna wonton appetizers at Gilligans. A lot of tacking against the wind and current today. Great wind, weather, here quicker than expected. Mary Lou and Fred helping with the jeep and sending us off. Almost Ready! An extra crewman this voyage. Rigging Spartina prior to launch in Rock Hall. Lots of running around today taking care of the last minute items. A couple of trips to Wal-Mart and the grocery store, set everything out in the garage, downloaded a new photo app for the iphone. 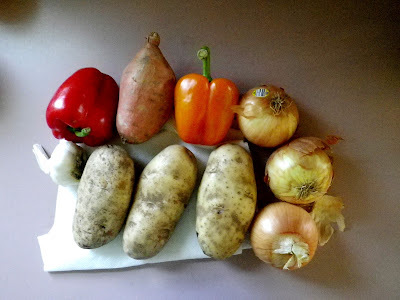 Fresh food of onions, peppers and potatoes. Beef, pork and chicken has been cut up and is in the freezer with a block of dry ice. 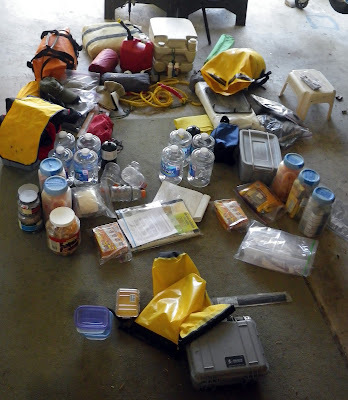 By afternoon just a couple of bags left in the garage to load tomorrow a.m.
Everything else is either stowed in the boat or packed in the back of the back of the jeep. 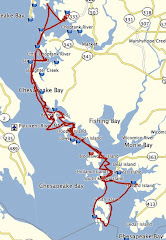 Hope to be on the eastern shore before daybreak tomorrow. The page now shows no tracks. It should go live hopefully around noon Monday. Got a few things set out in the garage this morning before work. 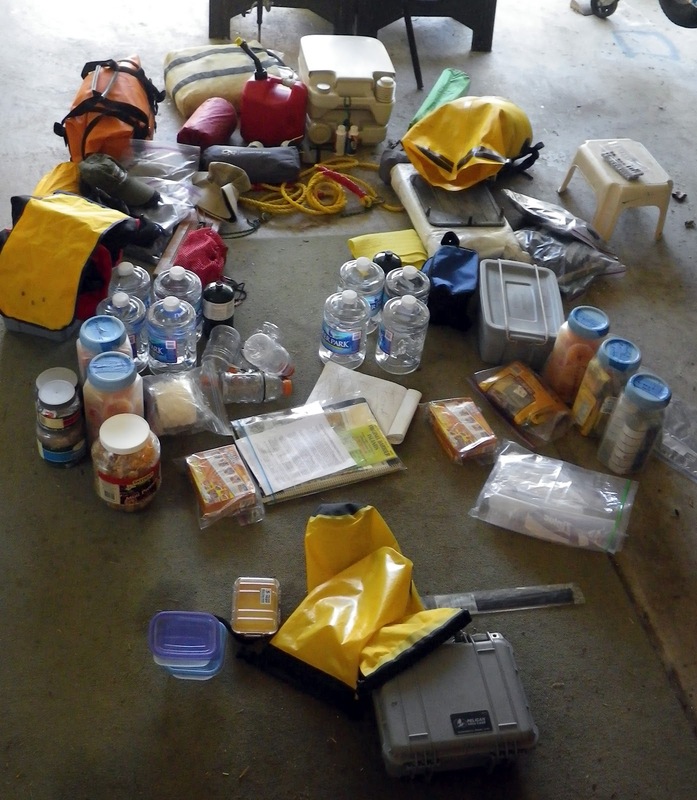 I do need to sort through the cook kit and light/notebook kit. 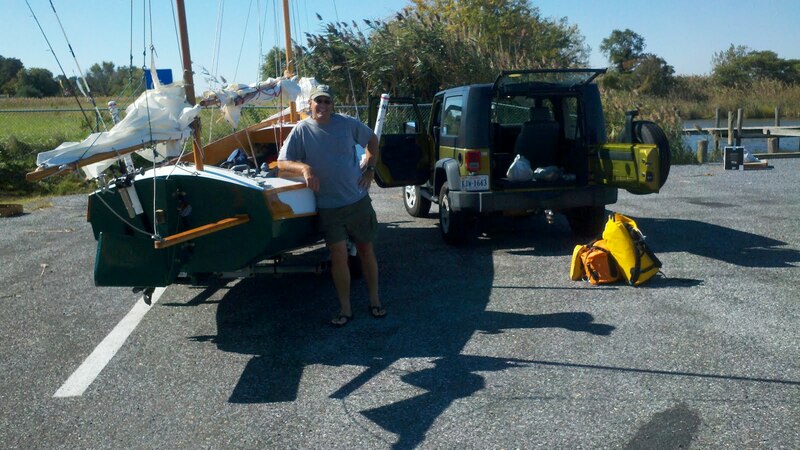 My sailing compadre Bruce has emerged from an undisclosed location. 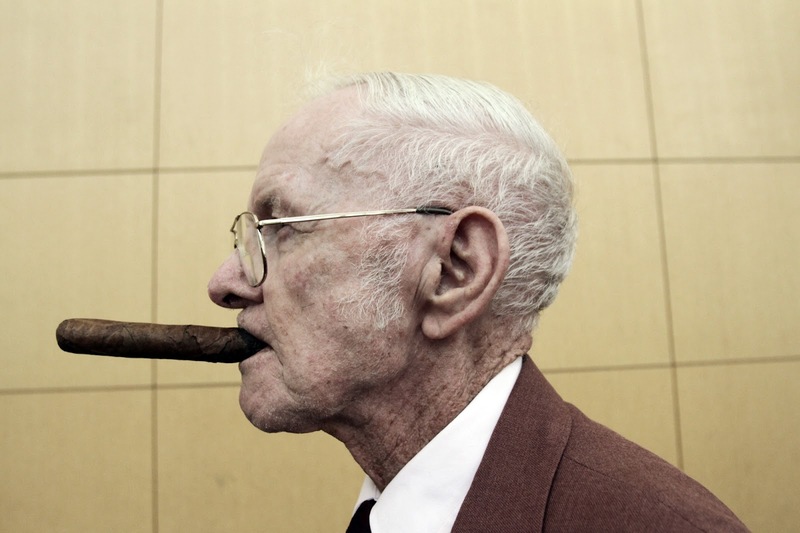 I had lost track of him and suspected - and still suspect for that matter - that he was/is in a witness protection program. Under pointed questioning he admitted to being in Hawaii, but provided no more details. I will confront him in person about this when he arrives at the airport tomorrow. The weather continues to look favorable for at least the first few days of the trip. 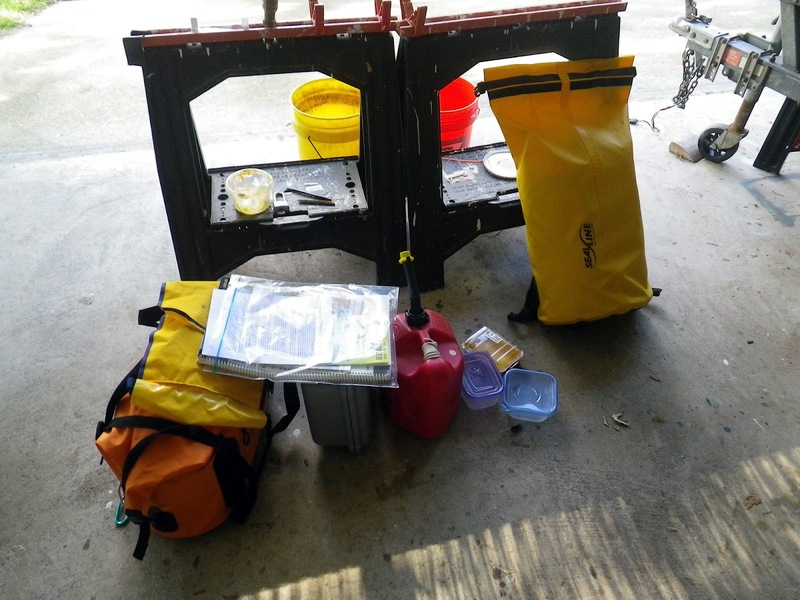 I picked up some two-stroke oil for the outboard and filled the two-gallon cruising fuel can for Spartina (on day sails I carry a smaller gas can). I've bagged all the trail mix and sorted through the food. I've measured and remeasured all the distances on the charts and continue to wonder how many miles we can make each day (and I continue to be impressed by the distances Washington Tuttle made each day in his cat boat). 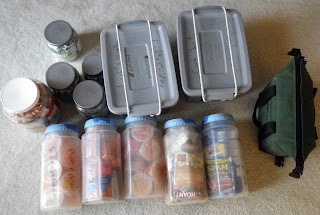 Fishing tackle seems to be in good order - I did add a second gold spoon for casting into the schools of bluefish and striper that are reportedly feeding in the upper bay. 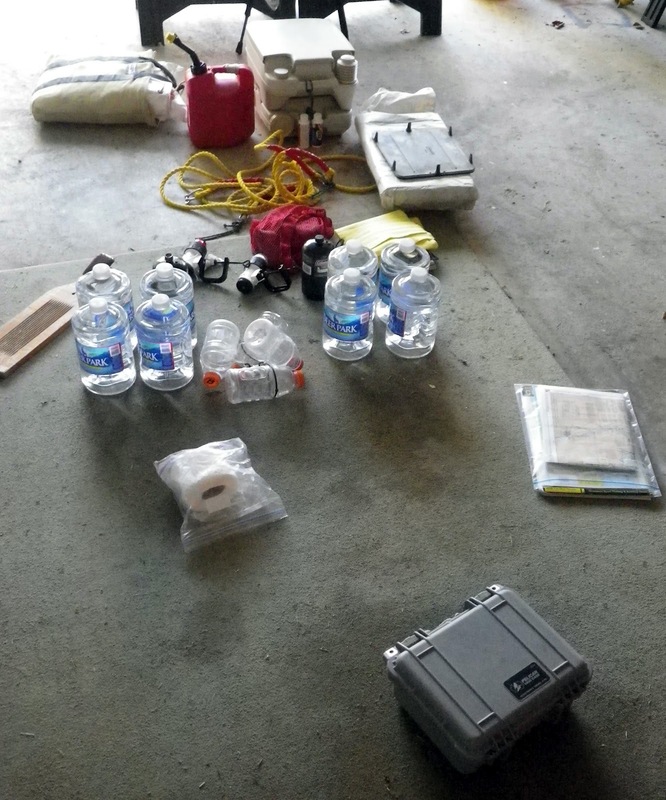 I still need to rebuild the hypothermia kit, plus buy some more AA batteries. 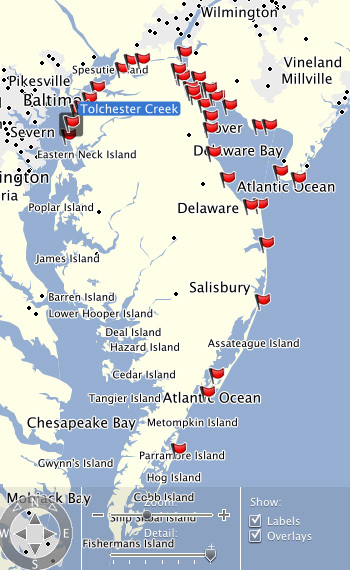 I spent about thirty minutes on google maps with a colleague at work who grew up in Dover, Delaware not too far from Delaware Bay. She and her Dad spent a lot of time crabbing out of the creeks on the bay and she certainly has a love of the water from her days on Delaware Bay. 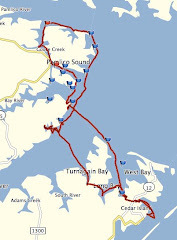 Being a huge seafood fan she was able to make a few suggestions for stops along the way including Gilligan's in Lewes. That is some of their food above. Maybe a nice lunch as we head down the canal through town?? We'll see. I'll be posting the SPOT tracking site tomorrow evening and then again this weekend before we leave. 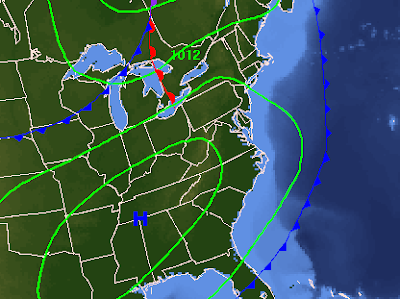 Above is the forecast for weather fronts five days from now. A large high pressure system will have moved in over the entire Atlantic coast. Slightly cooler temperatures, not much in the way of rain. I'll take that. What is behind the high?? We'll have a few days before we find out. I've starting bagging items for the trip. 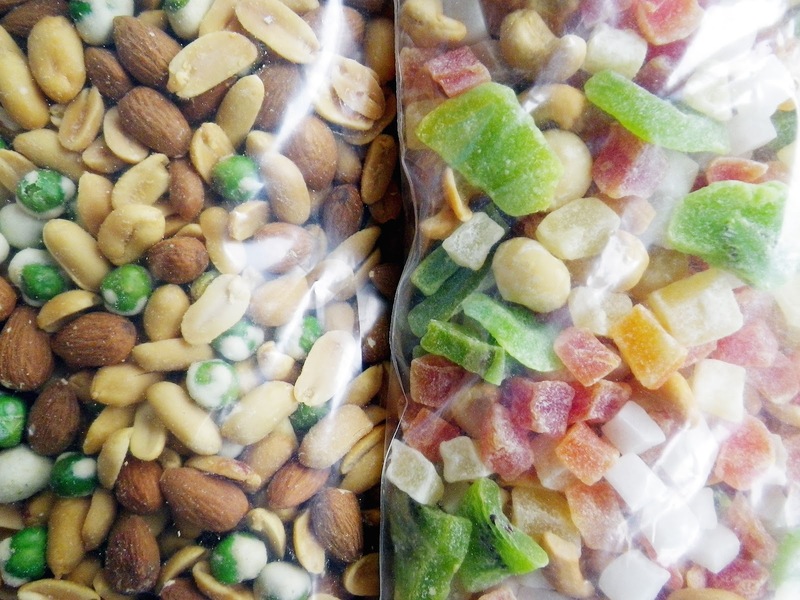 Above are the two trail mixes - peanuts, almonds and wasabi peas on the left and dried fruits, everything from mango to papaya, kiwi fruit and pineapple, on the right. These will be divided into about 2/3 cup portions and put in sandwich bags. 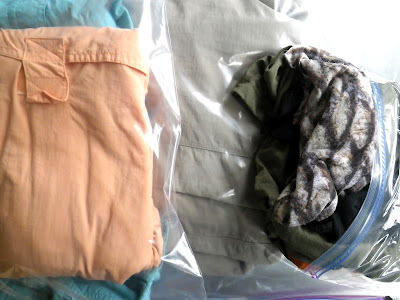 And the clothes are going into two-gallon freezer bags. There'll be just a few shirts and an extra pair of pants for this trip, really don't need much. I'm still struggling on ground transportation. The car rental place in Pocomoke City, Md says they "might" be able to pick us up in Chincoteague if it is a slow day, but could not guarantee it. If that doesn't work out we may be hitchhiking. I caved, just couldn't wait any longer to look at the forecast for early next week. The above shows six days out. 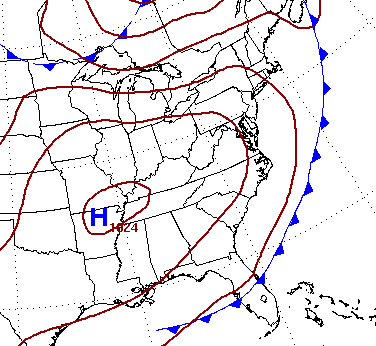 That's a long way aways as far as forecasts go, but I'll take a high pressure system and hope for the best. The weather, which had been beautiful for the last week, turned grey yesterday. The low clouds with little wind and no rain reminded me of the first days of both the spring Tangier Walkabout and last fall's Wet and Windless 162. Both trips had challenging weather. 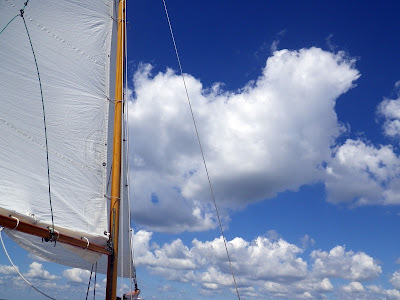 What came to mind with yesterday's clouds was not the weather but the feeling of casting off from the dock and knowing that I would not be returning for a while. Daysailing is fine, it is fun and I enjoy it. 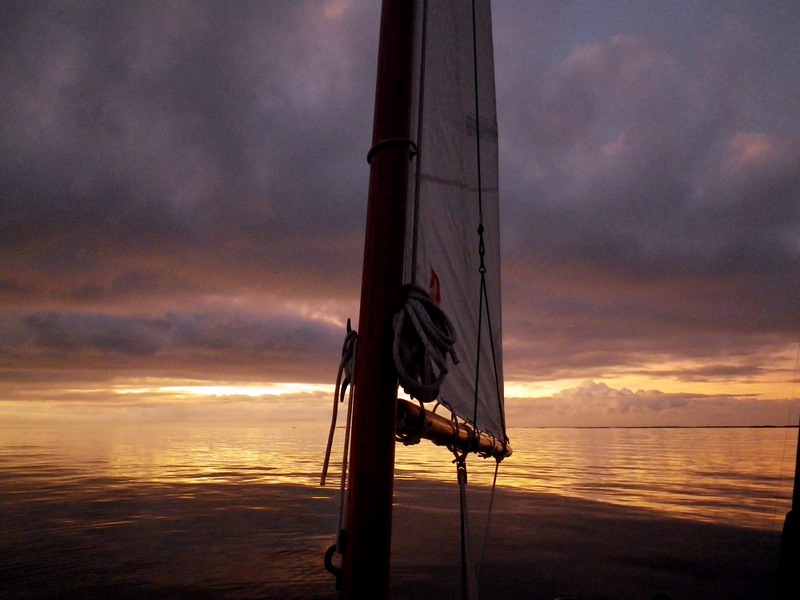 But casting off and sailing away, for just a few days or maybe a week or more, that is something different. I have not looked at the weather forecast for the trip. I'll probably take a peek Wednesday or so. Both Kevin and Mary Lou have told me that Pooles Island is off limits, something to do with unexploded ordnance on the island. Thanks for the information. The suggestion from Kevin, who sails the Welsford Navigator Slip Jig, is that we try to reach Still Pond Creek. Worton would work, he says, but Still Pond is prettier. 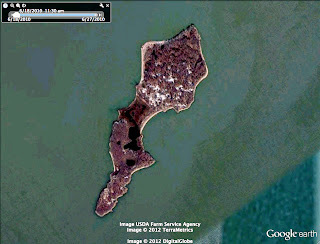 Just from looking at the satellite photos, I agree that it looks like a nice place to spend an evening. I've started packing clothes and sorting through the food, and I need to make a run to the hardware store today to pick up a few items for Spartina. 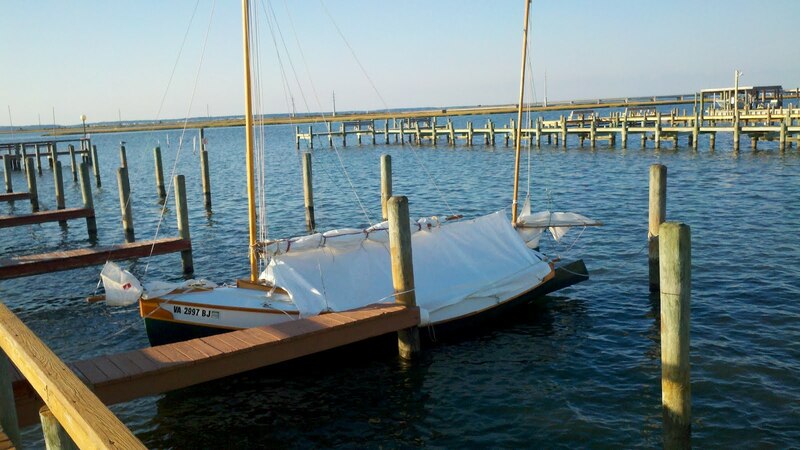 The weather is nice for sailing, but I need to get ready for the trip. 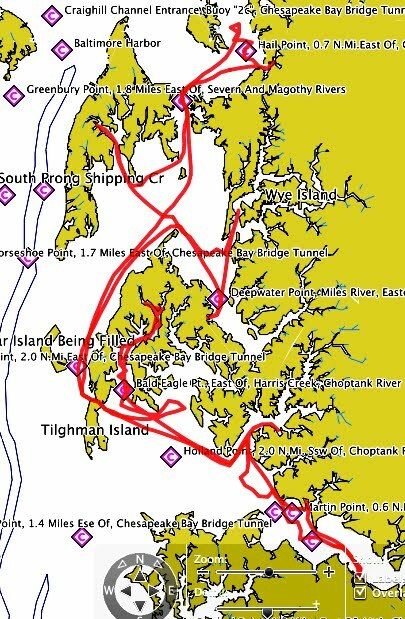 Looking this morning at possible anchorages on our first night out. 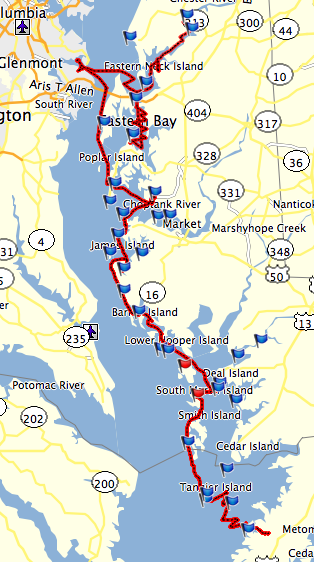 We'll leave out of Chesapeake about 5 or 5:30 a.m. (I can hear Bruce groaning from here, and he's still on the west coast), make the drive to Rock Hall, rig, load the gear/supplies and drop the jeep/trailer at Mary Lou and Fred's house not too far away. With all that I expect we'll be on the water around noon or so. Sailing north there are four possible anchorages anywhere from 15 to 18 miles from Rock Hall, which would be the right distance for an afternoon sail. Three of the possibilities are creeks on the eastern shore - Fairlee, Worton and Still Pond - and all look to be nice places to visit. Excellent protection and undeveloped shores lines, all are surrounded by a few homes and farmland. 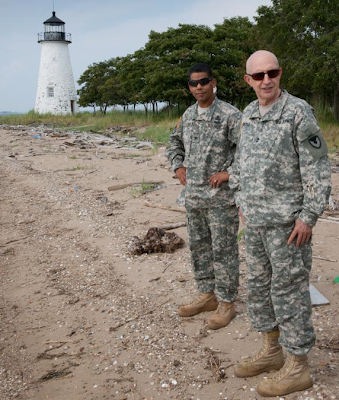 There is also Pooles Island which I think belongs to the U.S. Army and is associated with the nearby proving grounds. I am not sure if it is accessible at all. 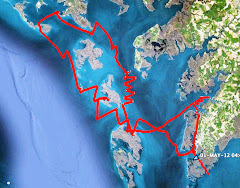 I've emailed Kevin of Slip Jig fame, who sails up in that area, so see if he has any advice on the island. There is an old lighthouse on the island, and it seems like it would be a nice place to visit. As for the first night's meal, Bruce may be thinking of the shrimp and chicken gumbo which he had made on an earlier trip. 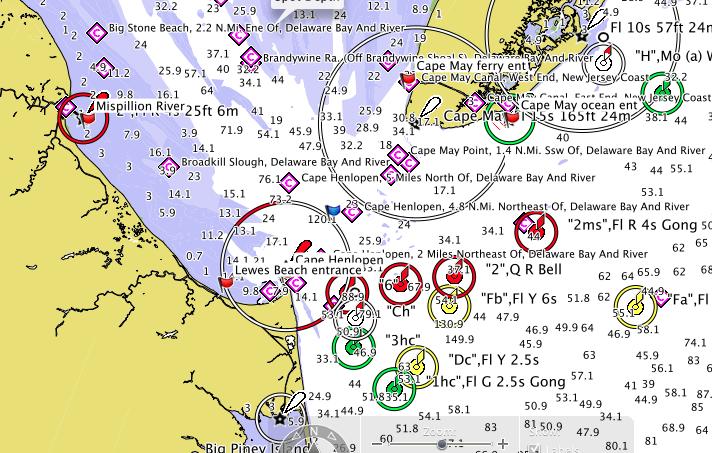 But I'm also hearing that the striper fishing is excellent up on that part of the bay right now, so we ought to keep our options open for fresh fish on the griddle. 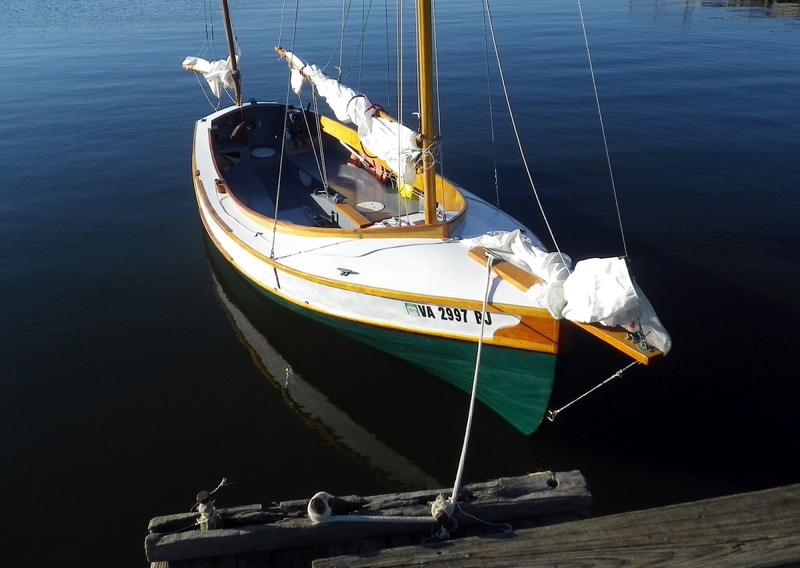 "It has been said that the amount of water boiled aboard a small boat would make you think that Marcus Wellby, M.D. was in the forepeak delivering twins." 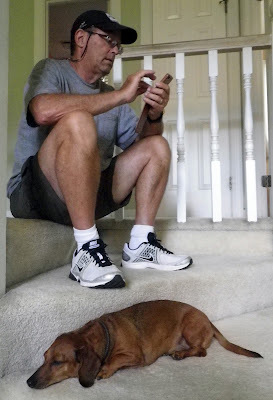 I'm home today on injured reserve, fighting off a flu bug. The CDC lists my state as having "sporadic" incidents of the flu, but I just came from spending five days with people from all over the country (with several states having outbreaks). I'm glad to get the bug out of the way now. I made some use of my down time going over the track, charts, satellite images. 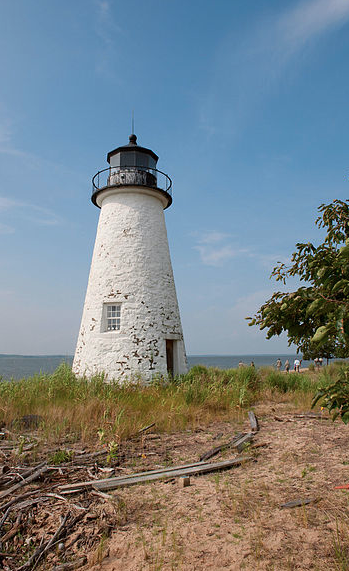 Visiting Cape May, which appeals to us for a few different reasons, may be dropping a little lower on our list of goals. Why? 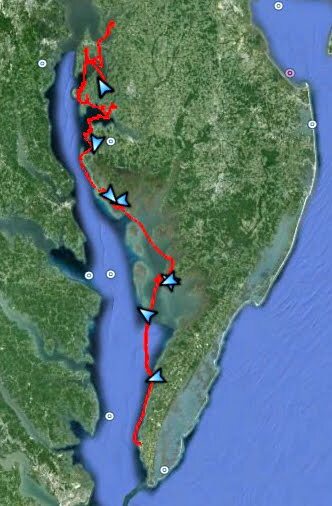 It would add about 40 to 50 miles to the trip, including a 17 mile crossing of the mouth of Delaware Bay. 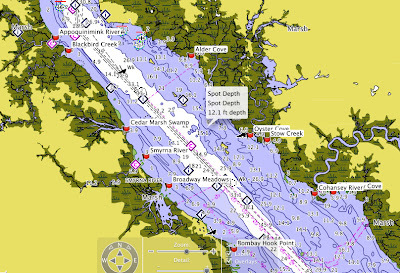 Looking at the tide forecast we might be crossing the bay with a 2.5 kt incoming tide. If the wind were out of the N or NW, it could get very lumpy out there. I'm not sure we want to cross the bay and deal with all the shipping traffic under those conditions. 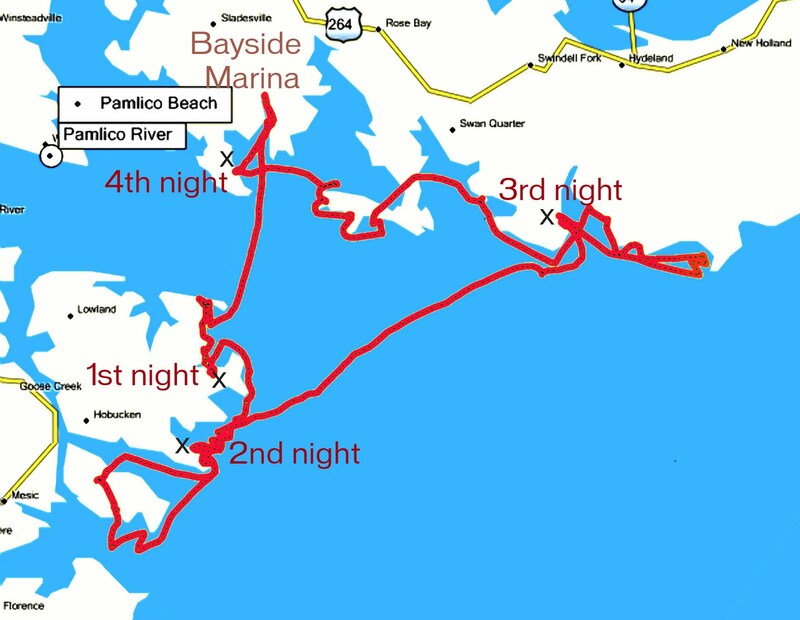 I wish we could visit the "Jersey Shore", but we might be better off tracking the western (Delaware) shore of the Bay, sticking with the shallower water and avoiding the wide mouth of the bay. Safer, simpler and less likely to have weather issues. And this would be following the path of Washington Tuttle, which was our goal in the first place. 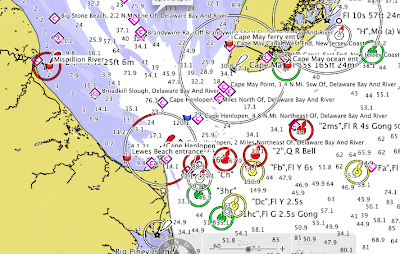 ps - After having made the above post I decided to check my references on small boats crossing Delaware Bay. The four written records I have - Nathanial Bishop's Voyage in a Paper Canoe, Frank Dye's Sailing to the Edge of Fear, Lee Hughes' The Biggest Boat I Could Afford and of course Washington Tuttle's recollection - all show the small boat voyagers crossing Delaware Bay near the eastern entrance to the C and D canal where the Bay - really a river at that point - is a couple of nautical miles wide. If avoiding the wide mouth of the bay and ocean currents was good enough for them, it is probably good enough for us too. I'm tempted to say "discretion is the better part of valor" but there is no valor here - just a couple of guys having fun on a small boat. 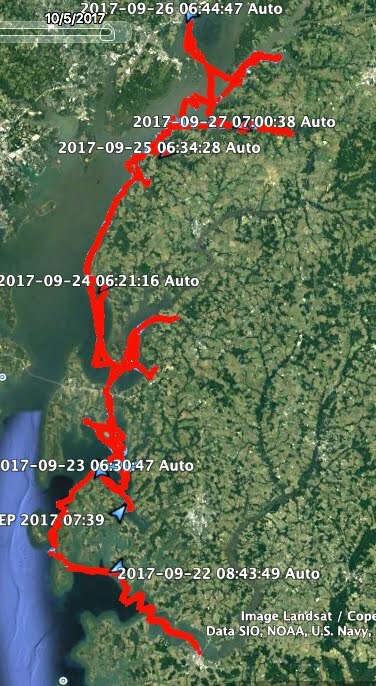 I connected my gps to my laptop and opened Garmin's Homeport software only to find that the waypoints, which I had thought I had created for this coming trip, were nowhere to be found. 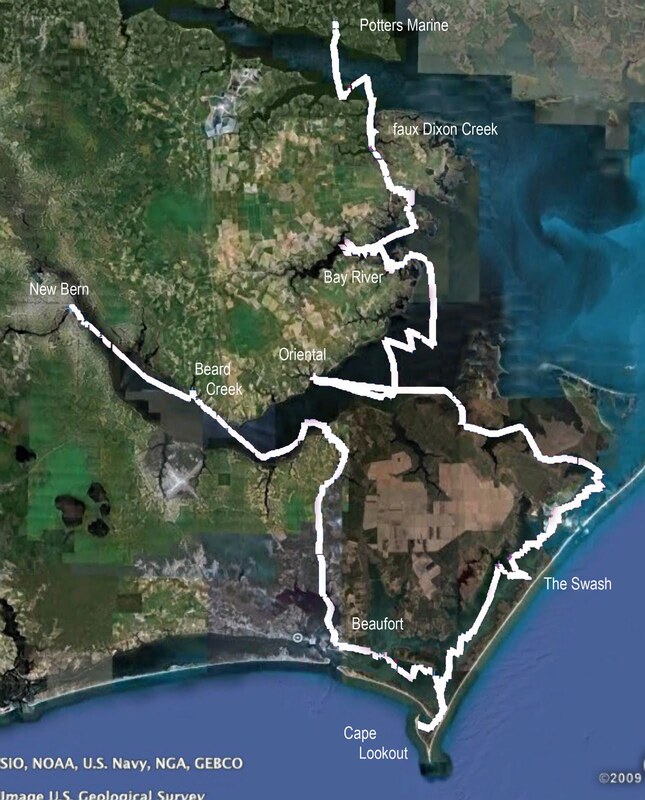 In retrospect I realized I had been so focused on (read worried about) Delaware Bay that I had marked only rivers, creeks and bays that offered refuge from that supposedly (we'll see) dreaded body of water. It took just about twenty minutes to go through the trip, from Rock Hall, Md. 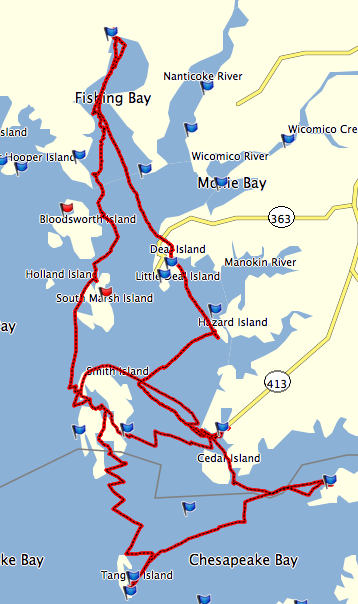 up over the top of the Delmarva Peninsula to Wachapreague, to add all the needed waypoints. 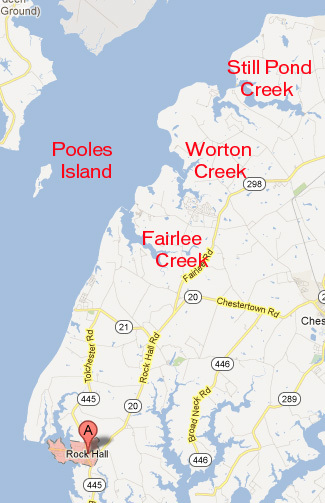 I marked a handful of creeks and rivers on Chesapeake Bay, including Still Pond Creek, the Sassafras River and the Bohemia River. 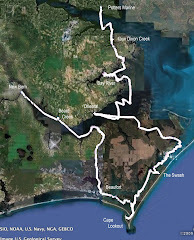 Heading down south on the oceanside of the peninsula I marked Lewes, Indian River Inlet, Ocean City Inlet, Chincoteague Inlet and Wachapreague Inlet. That should be enough, maybe more than enough. 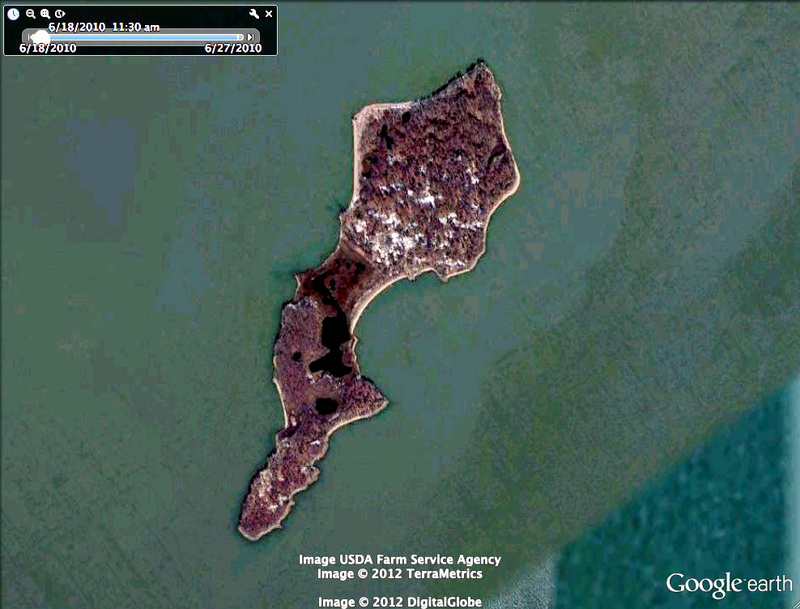 Above is a detail image of Delaware Bay showing creeks and bays where we could hide, if need be. 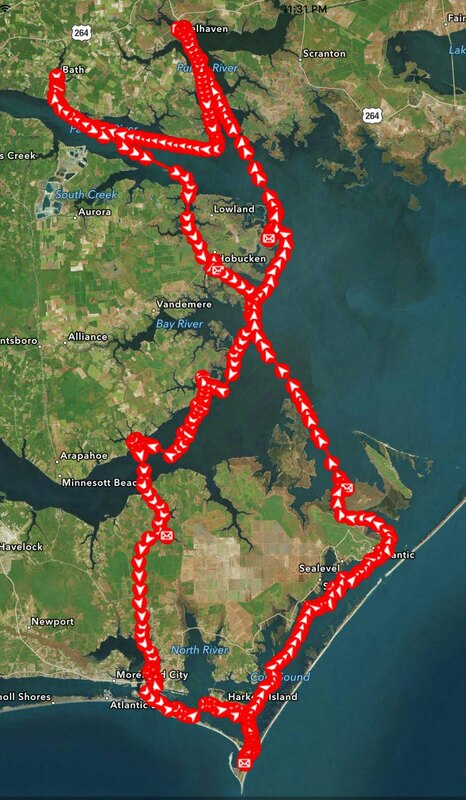 Here are all the waypoints on my gps. 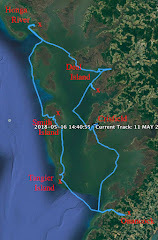 The new waypoints for this coming trip are there, plus the marks which I have used on both Pamlico and Tangier Sounds in the last year or two (waypoints from our spring cruise of last year, which covered a larger portion of the bay, are for some reason missing). The image struck me as an interesting visualization of where I have and have not been. 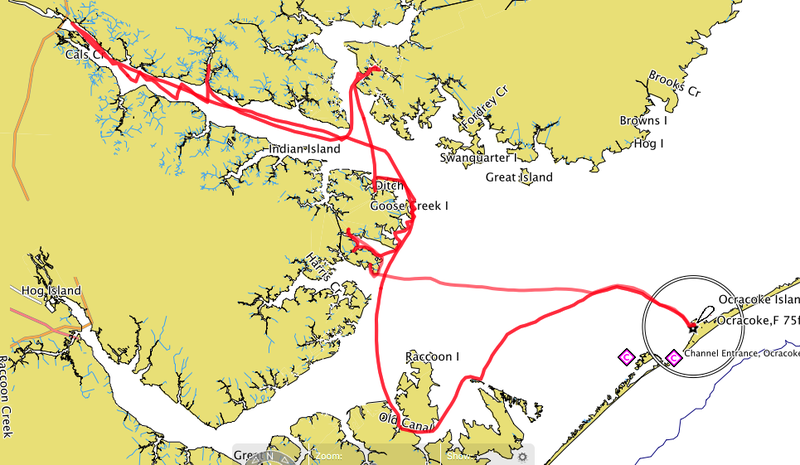 I've sailed a lot on Pamlico Sound and the middle part of Chesapeake Bay. 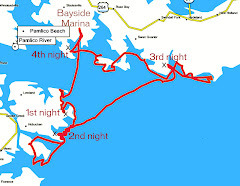 We'll head north on the bay and down the ocean side of the peninsula in just a few weeks. The southern tip of of the Delmarva will have to wait a while. Albemarle Sound, which is north of Pamlico Sound in North Carolina (near the words Rocky Mount), keeps calling. In over 20 years of living in this area I do not believe I have seen fall arrive this quickly. It seems like it happened overnight. There will be some more hot days to be sure, but the season had definitely changed. I sailed yesterday with a reef tucked in, the north wind coming right down the Elizabeth River. Blue skies, white puffy clouds. I sailed down past the coal yards then continued to the James River. I had planned on heading back once I reached the James at Craney Island, but my last tack put me in line for Middle Ground Light a little ways up the James so on I went. Shook out the reef as we headed home on a following breeze, dolphins giving us company along the way. What a great day on the water. In less than two weeks we'll be on the trip. I need to start going through the chores one by one. Tonight after work I'll go over the waypoints and make sure they are all loaded on the gps. It was the light that caught my eye this morning. Beautiful, crisp and clear fall light. Excellent wind and a beautiful day. More tomorrow. Fall arrived this morning with a gentle rain that cleared quickly and left us with cool dry air. Forecast for tomorrow has clear skies and a high of 76. 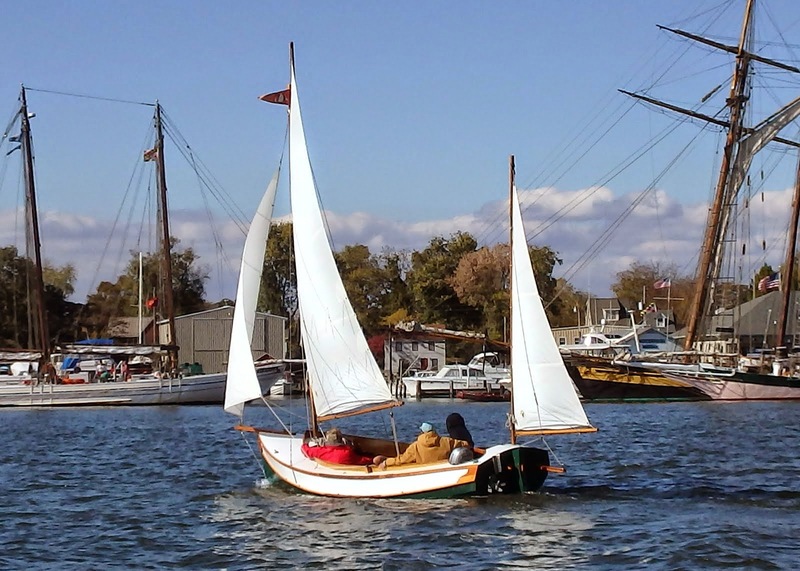 I hope to be on the water, the north winds of 10 to 13 kts carrying us down to the James River and back. My LL Bean am/fm radio, the one that woke me in the middle of the night with mariachi music, died last week. Too much moisture in a radio that was not designed to be water proof or water resistant was the cause of both the midnight music and the short life - only about 14 months - of the radio. 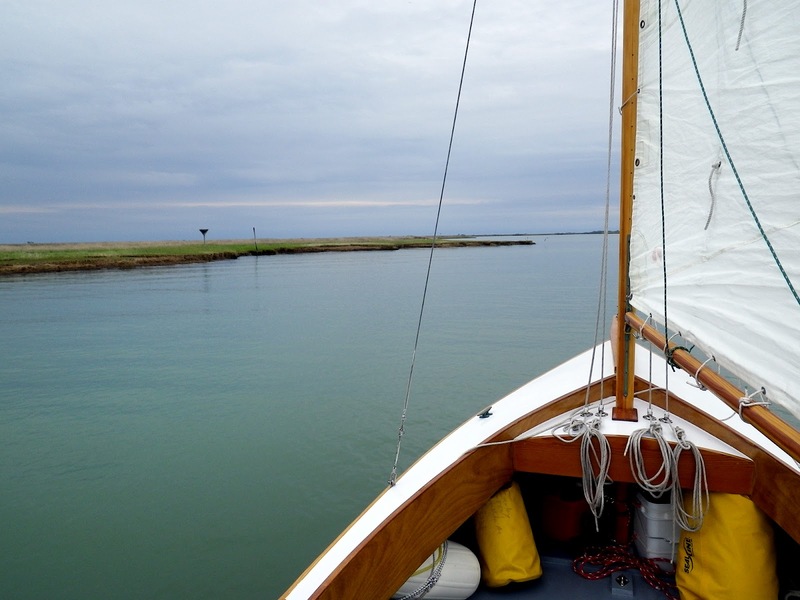 It had worked fine up until the storm on Abel Bay, but horizontal rain got to the radio beneath the small aft deck of Spartina and did it in. 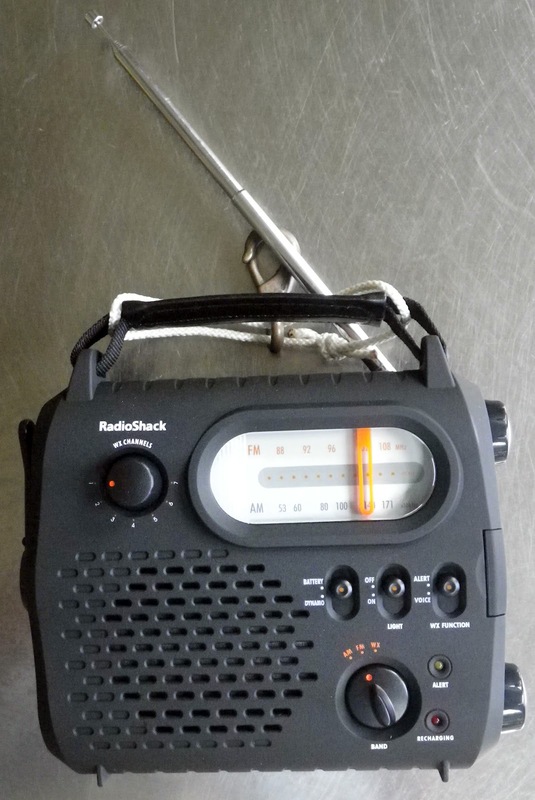 To replace that radio I just purchased a Radio Shack am/fm/weather band emergency crank radio, photo above. Cost was about $37 plus tax. The store offered a one-year no questions asked replacement warranty for $8, which I also purchased. "So I can drop it in salt water and get a replacement, right?" I asked. Yes, I was told. The radio seems to be well built, has a nice rubberized cover and gets very good reception in both am and fm modes. I'm listening to the Redskins/Saints game right now. There are functions I do not need such as a dynamo, flash light and weather radio, plus a receptacle for ear phones and a usb port. I will use electrical tape to cover the unneeded buttons and ports. For a fall trip, with both NFL games and baseball playoffs, a good radio is necessary. 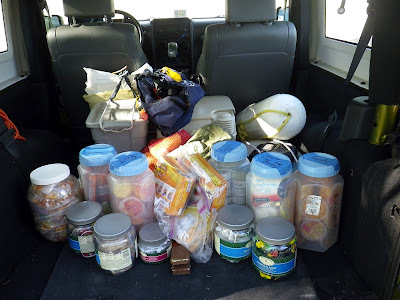 I did a quick food survey and found we are in good shape for the coming trip. We'll be using a variety of fresh and frozen foods, plus some pouch meals. Above are three of the pouches we'll be trying out. I used the tortilla stuffers on my last solo trip. 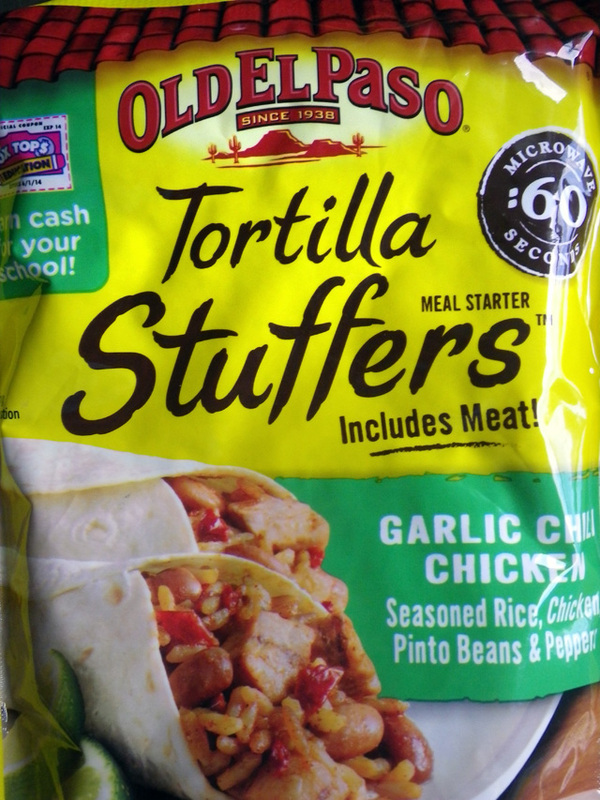 I chopped up a potato and sauteed it in a little oil, then added the pouch contents - seasoned rice, chicken, pinto beans and peppers - inot the pot. 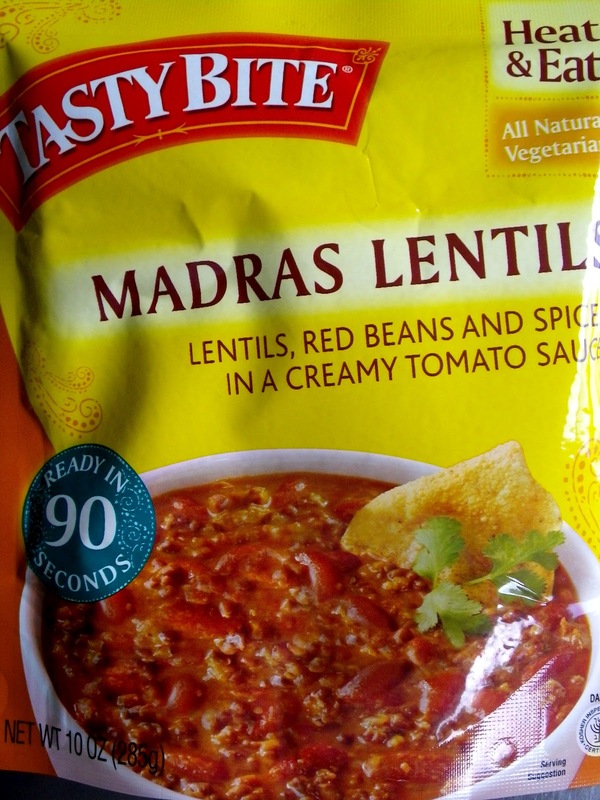 A quick, easy, one pot meal. 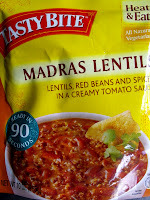 Bruce brought along the Madras Lentils on our sail last spring. Adding sauteed shrimp and andouille sausage, the turned it into a very nice gumbo. 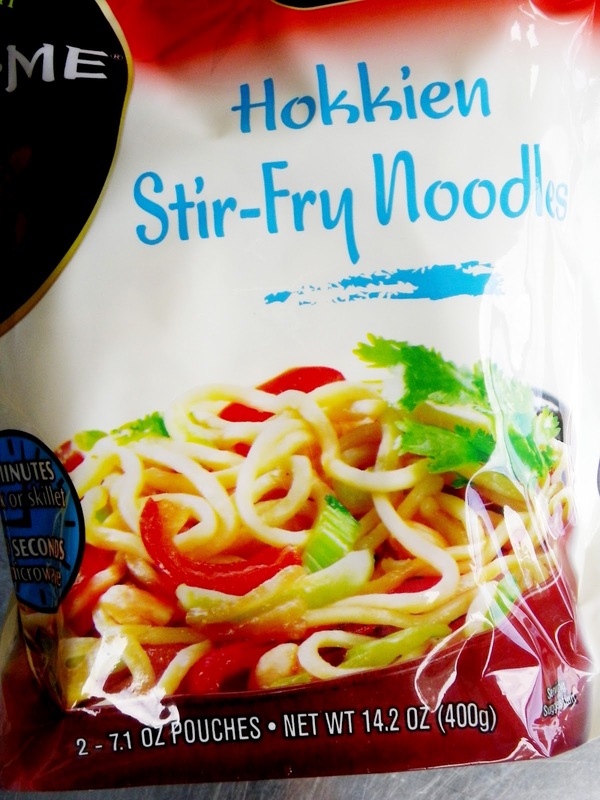 The stir fry noodles are something new. 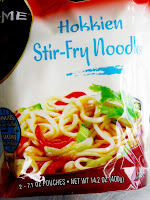 Two minutes to cook, with meat or fish added along with a little sauce, should make for another quick easy meal. The nice think about pouches, as opposed to cans, is that they are easy to open and do not take up much space in the trash once used. I received my copy, ordered through Amazon as a "used" book but in fact brand new, the other day. I started to read it, then set it aside. It would be a perfect book for a cruise. 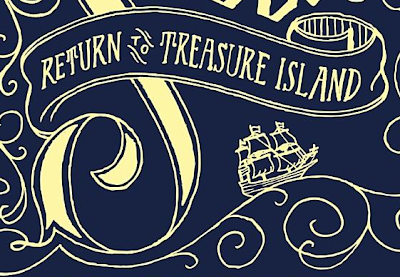 I've been thinking about a four or five day solo sail on Tangier Sound in October - perfect time for fishing - and this might be the perfect book to take along. Back home this morning before 9 a.m. There was a distinctly fall feeling in the air when we landed. It is hot and humid this afternoon, but the cool mornings tell me the seasons are starting to change. Above is my view out of the aircraft window as we came over Norfolk. 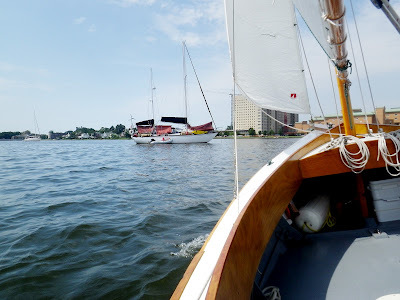 I launch Spartina next to the ball park (just across from the big barge) at the right of the frame on the Eastern branch of the Elizabeth River. 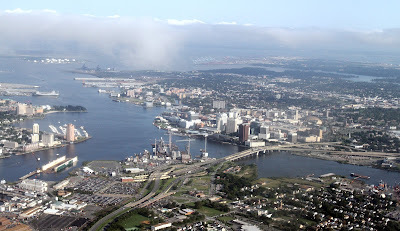 Much of my day sailing is on the main part of the Elizabeth River between the bridge near downtown to where the Elizabeth meets the James River, top center beneath the morning clouds. Mile Marker "1" of the intracoastal waterway is just off of Hospital Point, the wooded point that juts out onto the river at the left. 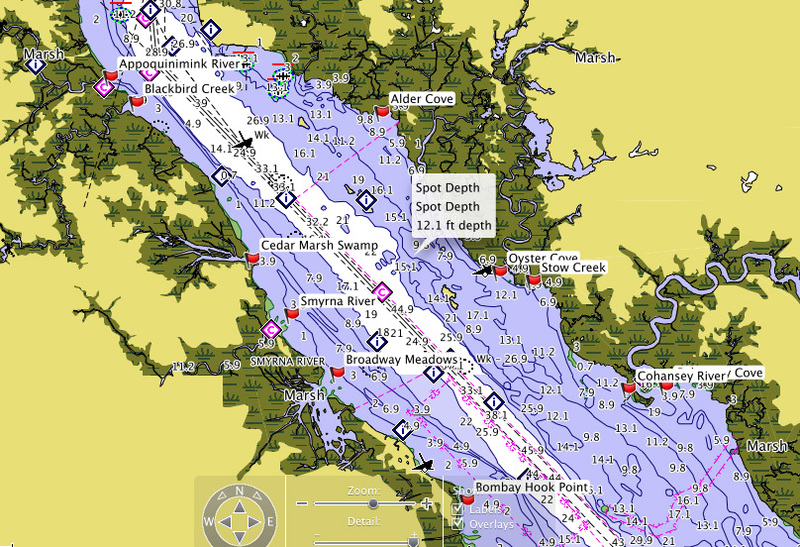 Just below point is Crawford Bay, a favorite anchorage of those going up or down the ICW. 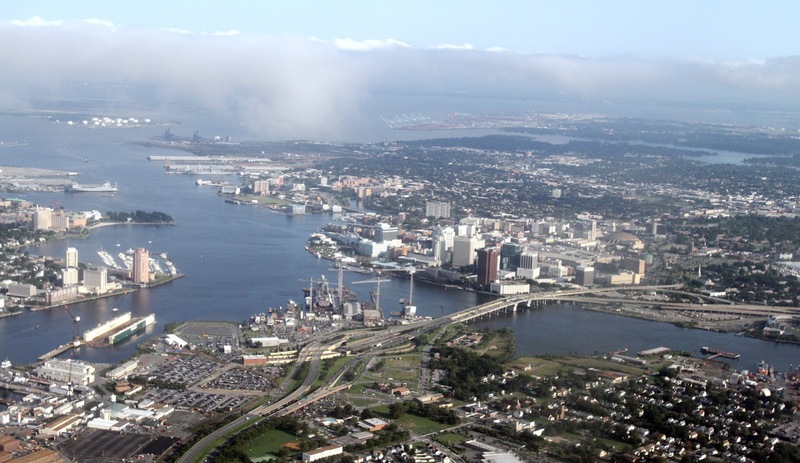 Portsmouth is to the left, Norfolk to the right, and Berkley, an old shipping port that is part of Norfolk, is at the bottom of the photograph. Less than three weeks now until the fall trip. I started a list of jobs in my last post but was so busy this past week I never found the time to get back to it. I will start focusing on the trip this weekend. 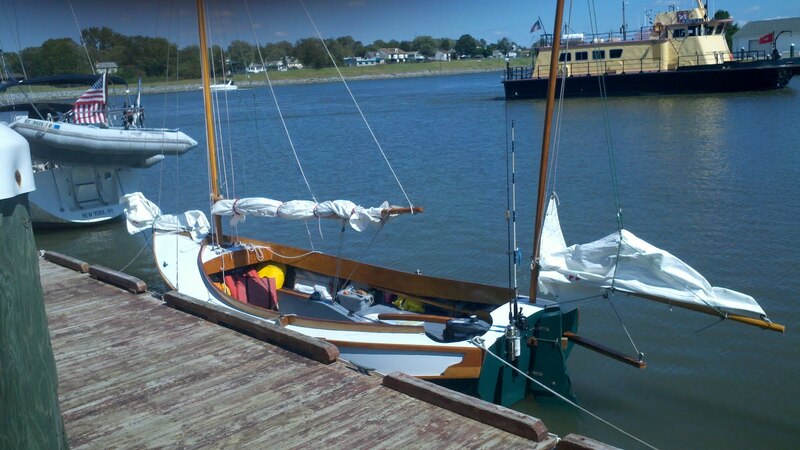 In the meantime there is a nice for the next few days and I do hope to get out for a day sail on the river. I'll be home in two day, just a little over two weeks before we leave on the fall trip. There is a lot of work to be done in those two weeks. I've been trying to think about it, but I'm too busy during the day and too tired at night. But I'll start a list here. I'll add to the list when I can think of more things. 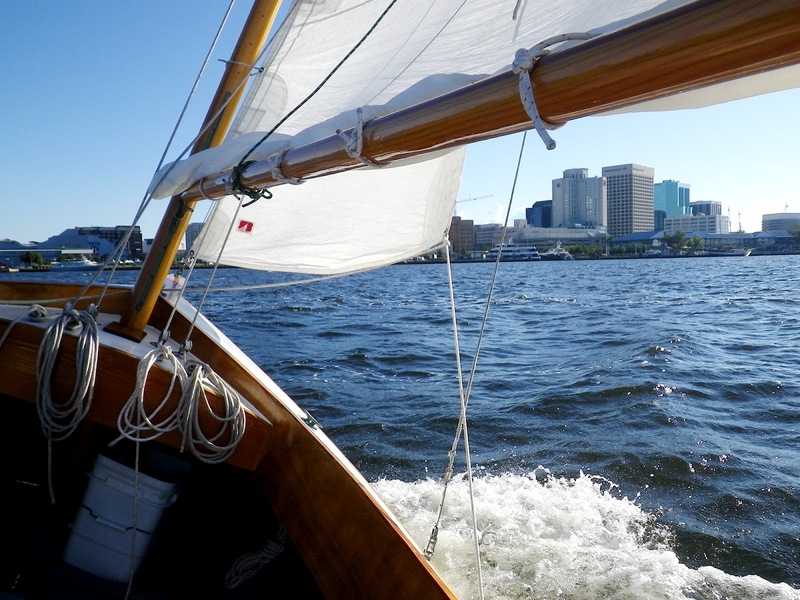 Yesterday I was on the water on a very pretty day. 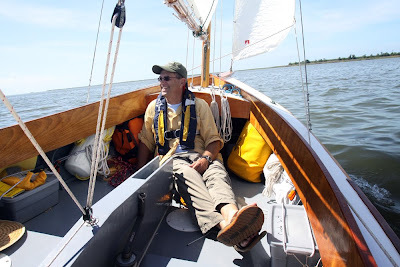 A nice breeze out of the north reminded me that I was beginning the final three months of my sailing year. In September the winds begin to shift from southwest to somewhere out of the north, northeast or northwest. The temperatures fall. 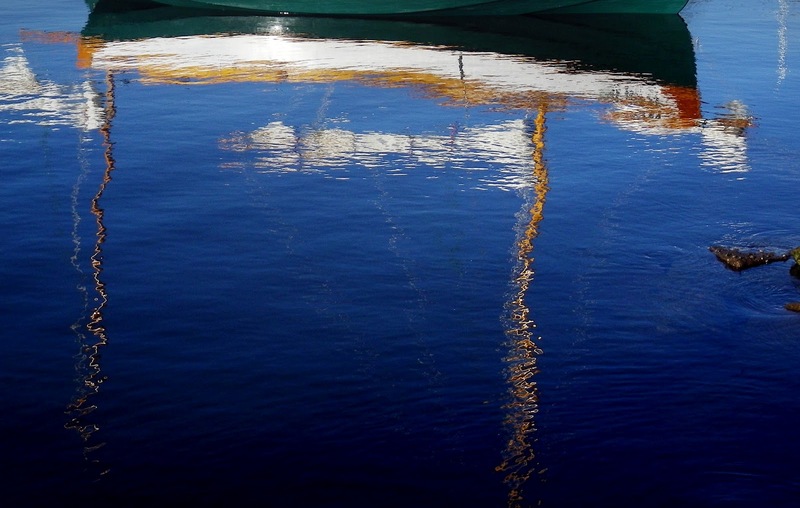 And the skies, without summer's humidity, deepen to a rich blue. Soon I will start thinking about bringing a jacket along for day sails. In winter I look forward to the chilly sails of spring. In spring I look forward to the heat of summer. And in summer I look forward to the cool breezes of fall. I am ready for fall. 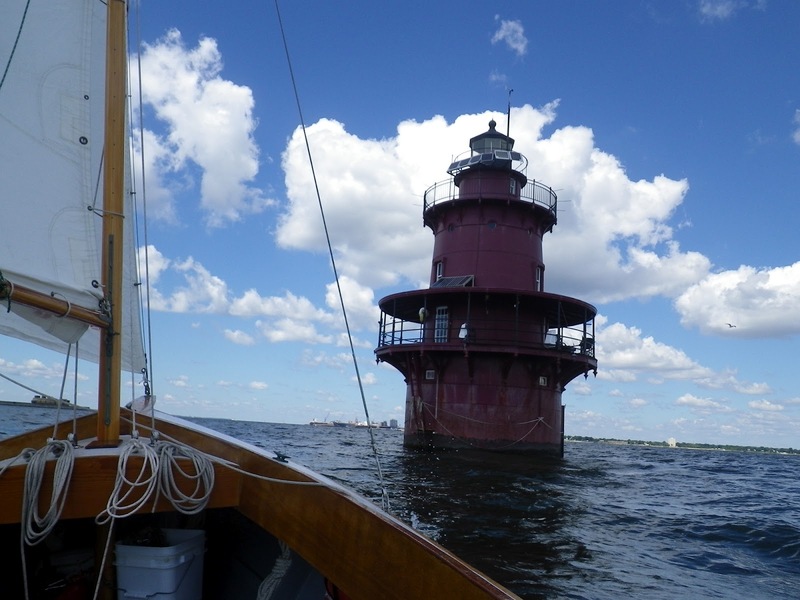 Yesterday the breezes started out light and then filled in to maybe 10 knots or so. I was content as Spartina tacked back and forth across the river. Joggers waved from along the shore. 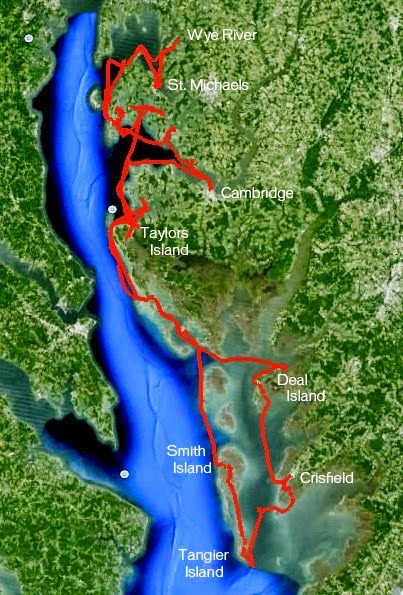 A handful of boats passed through on their way south. 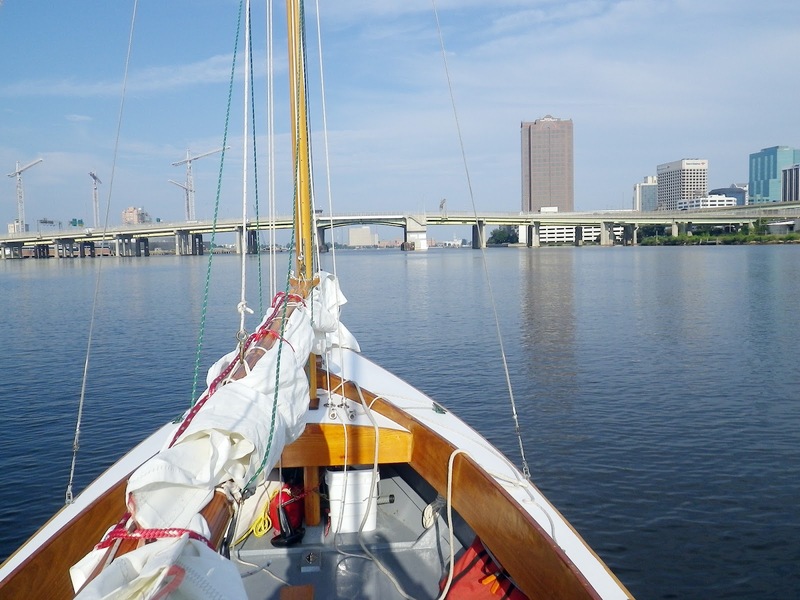 And I exchanged greetings with the crew of the Virginia as they worked to get the schooner ready for October's Great Chesapeake Bay Schooner Race. I could have stayed out there all day, but had to head in a little early to pack for a trip. 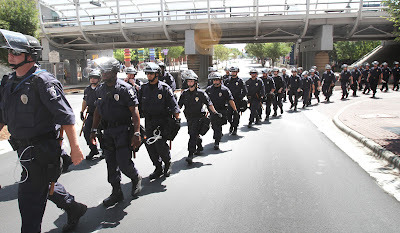 Today I find myself in the Queen City, feeling as if I'm living in a police state. Hot and crowded, flashing lights and barricades. I think I liked yesterday better.